We all want a pest free yard and garden. With grass, the kids can play in without worrying about being bitten and flowers you can bring in the house without bringing a host of insects inside too. And we want a yard that is safe for our pets to run around in as well. The concept is quite appealing, isn’t it? To get rid of any insect pests you may have, you will want to apply an insecticide, also known as a pesticide. These are quite obviously insect and pest eliminators and repellents. Once applied to your yard or garden, insecticides can keep pests under control for potentially an entire season. Well, as great as a pest-free yard and garden sounds, there are some things to consider before you start tackling a pest problem; your pet’s health and safety. Before you set out on the warpath to defeat those pesky insects, you may want to consider the health risks that your pets may face if they come in contact with an insecticide. There are many dangerous chemical ingredients in pesticides that can poison your pets. To give you an idea of how insecticides or pesticides can impact your pets, here’s a quick video that describes how an animal can react if they come in contact with these products. Note: the brief discussion about the actual impact on pets is near the end, but the rest of the video is also quite informative and worth a watch. Also, though the Hawaiian Humane Society discussed this, these effects and rules can apply to the mainland as well. They quickly mention some of the side effects that pets can experience if they are exposed to or come in contact with insecticides. Here are some of the problems an insecticide can cause in your animals. Obviously, the most extreme case when your pet comes in contact with an insecticide is death, but the other symptoms are things you certainly want to avoid. Just make sure that you are following the instructions on the bottle when applying the insecticide where your pets hang out. As you learned from this video, there are some insect killers on the shelves today that contain chemicals that can poison your pets while others contain chemicals that are a slightly safer alternative. Here is a short list of the insecticide ingredients that are safer, or less harmful, for your pets. As with most things that are dangerous for your pets to come in contact with, you should also make sure your children avoid these chemicals. Though there are safer insecticide options for your pets, you should still follow the warnings and instructions on the label. 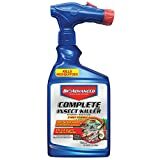 Though there are many insecticides on the market that are considered safe for pets to be around, we are discussing Bayer Advance Complete Insect Killer specifically (which is a very popular product on the market). So, is Bayer Advance really safe for pets to be around? Like pretty much every insecticide you can purchase today, there is a period, typically within the first few hours after application when the chemicals are most potent and most dangerous for your animals. Bayer Advance Complete Insect Killer is no different. However, unlike some other insecticides that suggest that you wait 5-10 hours or even days after application to allow pets in the area again, Bayer Advance only suggest 1-2 hours. Pesticides can be applied either via spray, powder, or granule. Each application has its own time needed to settle. The powder and granule versions will take a bit longer to take effect and will remain harmful to your pets for a long time because they usually require a solid soaking (rain or hose) to take effect. Instead of waiting for rain, you can speed up the process by soaking your lawn with a garden hose or sprinkler. Though, you will want to wait for the soil and grass to dry before reintroducing your pets to the area. The spray version of most pesticides can be both safer and more dangerous for pets. It can be more dangerous because it is a liquid and can be absorbed and ingested more easily by pets. And it can be safer because once it dries, it is practically harmless to your animals. Bayer Advanced Complete Insect Killer is a spray-on insecticide that is safe for pets to be around within 1-2 hours after application per the manufacturer. However, it wouldn’t hurt to avoid the area altogether for a few days (3 days) if possible to ensure there is no dangerous contact possible. Because it dries so quickly, it is one of the safer pesticides for pets to be around. Also, it takes care of those pesky summer-time pests that can bother your pets; fleas, ticks, mites, etc. If you know your yard is full of harmful insects, Bayer Advanced Complete Insect Killer seems to be the insecticide to use to take on those annoying critters. From the perspective of an owner of outdoor dogs who fights pests all summer long if an insecticide isn’t applied, I’m all about using this product. Though I do make sure I am following the instructions on the product label! I cannot stress the point of adhering to warning labels and instruction guides for products that have any hazard potential. It is irresponsible as a pet owner and as someone using a product to ignore safety labeling. It is there for your protection and your animal’s protection. I’m not sure why they won’t ship to Canada. Maybe try contacting Bayer?